Peanut butter is one of my favourite foods. Of course it’s incredible on toast, but toast is out of bounds when you are low-carbing. It’s great as a snack though with apple slices or sticks of celery. You can choose the worthy peanut butter – the stuff without sugar or salt – but I suspect most people love the cheap stuff. I find most own-brand peanut butter indistinguishable from the brand leaders. Anyway, I created a new recipe this week – Peanut Pork. It’s basically a satay sauce type recipe that makes the most of peanut butter and pork, two ingredients I really love. You can double it up easily enough to serve more people. Cut the pork steak into evenly-sized cubes (about two centimetre squared). 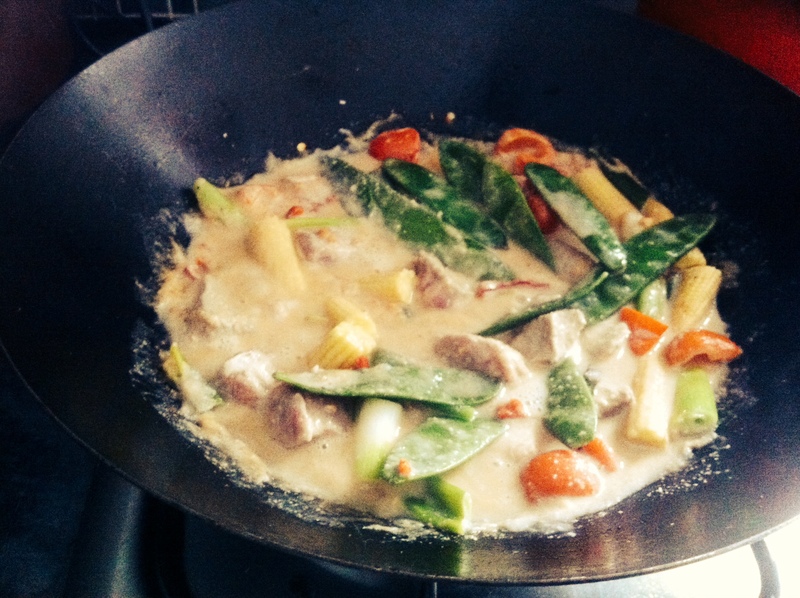 Melt the coconut oil in a wok and add the spring onions, pepper and baby sweetcorn. Stir-fry for five minutes. Chop the creamed coconut up and add this and the peanut butter to the boiled water. Whisk well to combine. Add this to the vegetables and bring to a simmer. Add the pork and allow to simmer for five minutes. Add the mange tout and simmer for another five minutes. Season to taste with the salt and pepper. Serve with cauliflower rice or in bowls with a spoon. Allow 20g of carbs per portion.